Spartanburg, SC - All Metals Service & Warehousing, Inc, a multi-facility toll coil processor headquartered in Spartanburg, SC, has installed a high-performance Braner/Loopco "Cassette" Leveler Servo Feed Cut-to-Length/Multi-Blanking Line in its flagship Spartanburg coil processing plant. The new line converts 60,000# x 72" wide ferrous and non-ferrous surface-critical coil in gauges from .028" through .135" into laser quality panel-flat sheets and close-tolerance precision blanks. 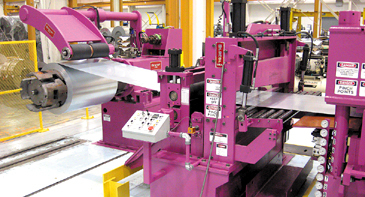 All Metals' new Multi-Blanking Line, capable of producing full width sheets, side-trimmed sheets, and simultaneously multi-blanking up to five (5) close-tolerance blanks, is equipped with a Computer Controlled Hydraulic Cassette Leveler, Precision AC Servo-Feed, and a variable speed DC Shear capable of generating close-tolerance parts at production rates exceeding 80-strokes/minute. 60,000# x 135"/.028" Hi-Performance Cassette Leveler-Servo-Feed-DC Shear CTL/Multi-Blank Line. Hydraulic Cassette Leveler: A "Cassette" Leveler allows All Metals to produce laser quality panel-flat parts throughout a wide gauge and product range. Microprocessor controlled hydraulic work roll positioning cylinders are contained within the massive 4-post Leveler frame into which quick-change Cassettes are installed. The exchangeable Cassettes contain all the working Leveler parts . . . work rolls, back-up flights, and universal drive shafts, in a common Cassette housing. Cassettes are powered in and out of the Leveler frame by pushbutton. Cassette back-up flights are automatically aligned with the hydraulic back-up cylinders. The work roll drive shafts are automatically engaged with the Leveler gear drive as the Cassette is installed. A microprocessor controller automatically accomplishes initial Leveler set-up based upon operator entered coil gauge and yield strength mechanical properties. All Metals' Cassette Leveler employs 18-independent hydraulic cylinders rather than AC motors, gear reducers, sliding wedges, and jack screws to accomplish Leveler adjustments. Precision electronic linear transducers achieve precise cylinder positioning. Seven (9) hydraulic cylinders installed at the entry, and seven (9) hydraulic cylinders installed at the exit end of each back-up flight are independently adjustable. Adjusting the entry end and exit end cylinder elevations causes the work rolls to be "tilted" front-to-back for coil-set correction. Adjusting cylinder elevations across the work roll face accomplishes "roll-bending" for precise edge-wave and center-buckle shape correction. Hydraulic Leveler benefits include: Elimination of mechanical screw-wedge maintenance; Automatic Leveler set-up; Order set-up parameters retrieved from computer memory; and 5-minute automatic Leveler calibration. Precision Microprocessor Controlled Hydraulic Cassette Leveler operating with 1.750" x 5-Hi Cassette. All Metals' Hydraulic Cassette Leveler is designed to utilize 1.750" x 4-Hi and 5-Hi, 1.500" x 4-Hi and 6-Hi, and 1.250" x 4-Hi and 6-Hi interchangeable Cassettes. The ability to quickly change work rolls and back-ups allows All Metals to process oiled carbon steel and critical surface non-ferrous coils one after another with virtually zero time lost to Leveler roll cleaning. Cassettes are exchanged Cassettes in minutes. 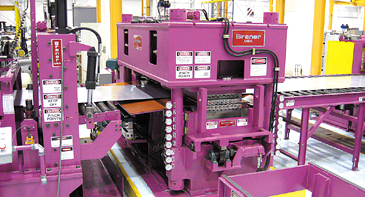 All Metals' Hydraulic Cassette Leveler produces Laser Quality Panel-Flat Strip. Cassettes can be power exchanged in a matter of minutes. Pushbutton Tooling Lock Turret Head™ Slitter: Precision multi-blank slitting to 0.0020" slit width tolerance is accomplished with a quick-change Turret Head™ Sitter fitted with Braner/Loopco's "Pushbutton Tooling Lock-Up" feature. 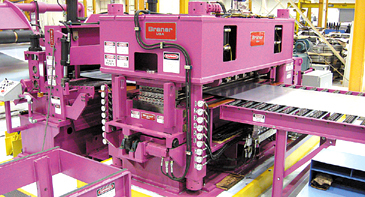 Slitter set-ups for multi-blanking or side-trimming are made in 15-minutes while the line is running, which virtually eliminates production down-time related to making slitter set-ups. 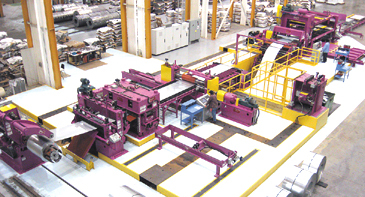 The Turret Head™ Slitter head is pushbutton withdrawn from the line when producing mill edge sheets. The Turret Head™ Slitter offers "Bullet-proof reliability," and no time lost related to Slitter set-ups.